Installation of 12 buoys and 11 perches, which were rebuilt on existing stone structures. 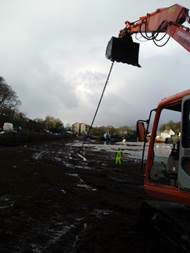 A digger was brought out to the perch locations on Multimac to excavate prior to installing a slieve for the new posts. 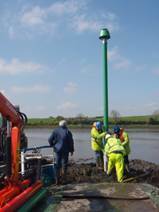 The channel changes (moving sand bars) in the Moy Estuary, so ongoing maintenance is provided and buoys need to be repositioned. Design & Installation of Yacht mooring trots. Annual inspection and maintenance of individual moorings. During this work each mooring is lifted and power washed to remove old growth. Risers, bridles and buoys are replaced as required. Mooring blocks and interconnecting chain are visually inspected as well. Removal of legacy mooring equipment – old mooring blocks, etc. Newport is now a model for similar mooring plans in other town harbours. 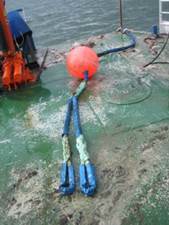 Installation an entirely new navigation scheme consisting of 6 buoys and 9 perches. 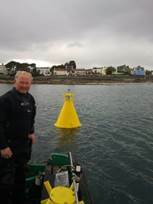 Installation an entirely new navigation scheme consisting of 12 buoys and 14 perches. 2006: Installation of 17 buoys and 1 perch. Since 1990: Design & Installation of Yacht mooring trots. Installation of visitor moorings in various locations along the Mayo coastline. Ongoing maintenance of these inspecting and replacing chains, shackles, swivels buoys, etc. and relocating moorings as directed.